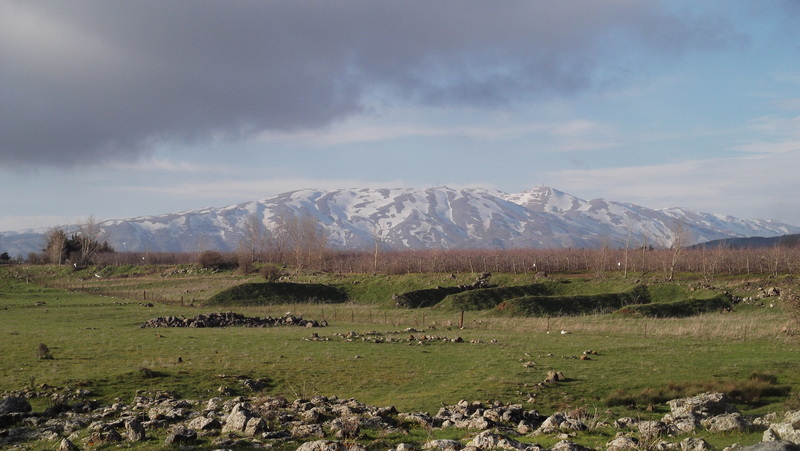 Mount Bental was the site of an important battle when conquering the Golan from the Syrian forces. Today, the bunkers atop the mountain have been mostly cleared out but are accessible to all. 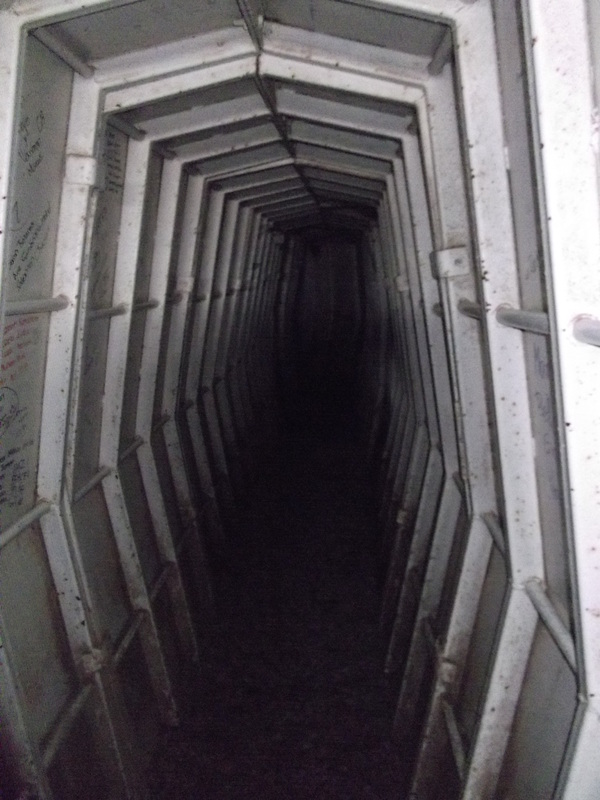 We ventured on in, glad to be wielding flashlights, and had a look around the deep old bunker. I was really fascinated by the bunker’s corridor walls which are strikingly similar to those in the Israeli movie Beaufort which was actually filmed at the Nimrod Fortress. And so concludes an amazing day – a day action-packed with history (both ancient and recent), adventure, scenery and natural beauty. 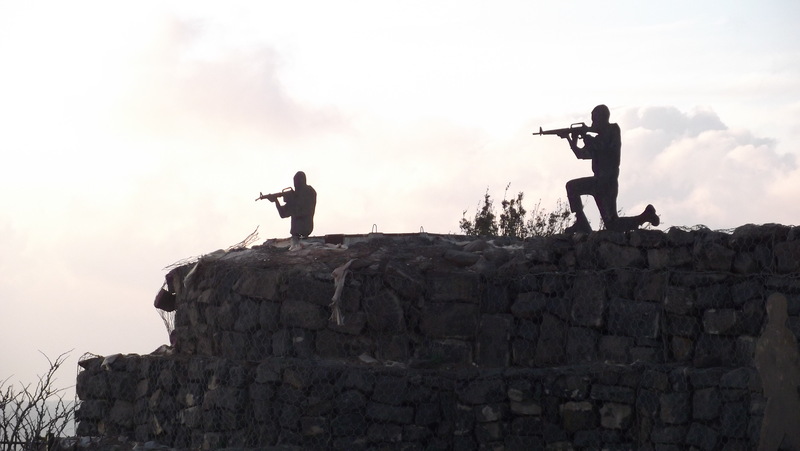 But of course, I was still way out in the Golan, nowhere near home. It was another two hours (by car, taxi, bus and feet) until I was home. That was a day I’d love to re-experience! 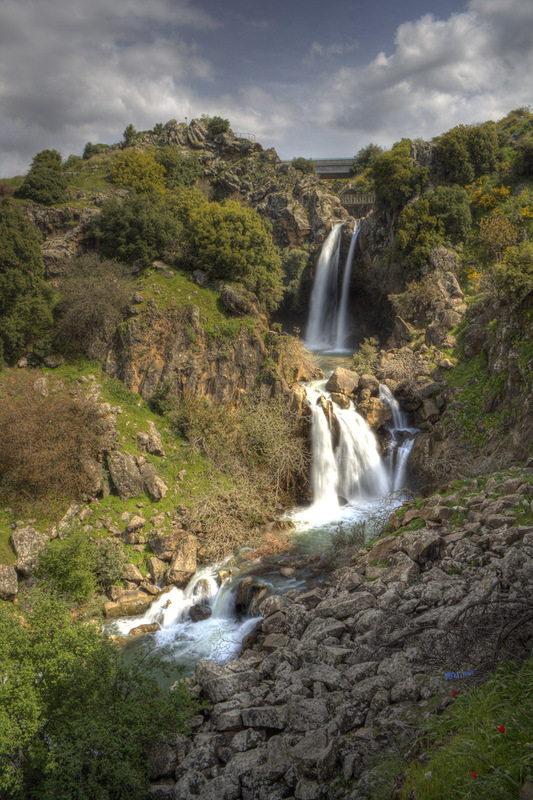 Continuing on after the previous stop at the Nimrod Fortress with my photographer friend Boruch Len, our next stop on our little tour of the Upper Golan was the Sa’ar Falls. We sought it out after seeing a picture of it posted on the Tourist Israel Facebook page (here), and eventually found what we were looking for. We parked the car and got out, asking an ice cream vendor for popsicles and directions. To our surprise, the paradise from the picture was just minutes from the road – by foot. It is actually possible to drive off the bridge and into the river… and then down the waterfalls. 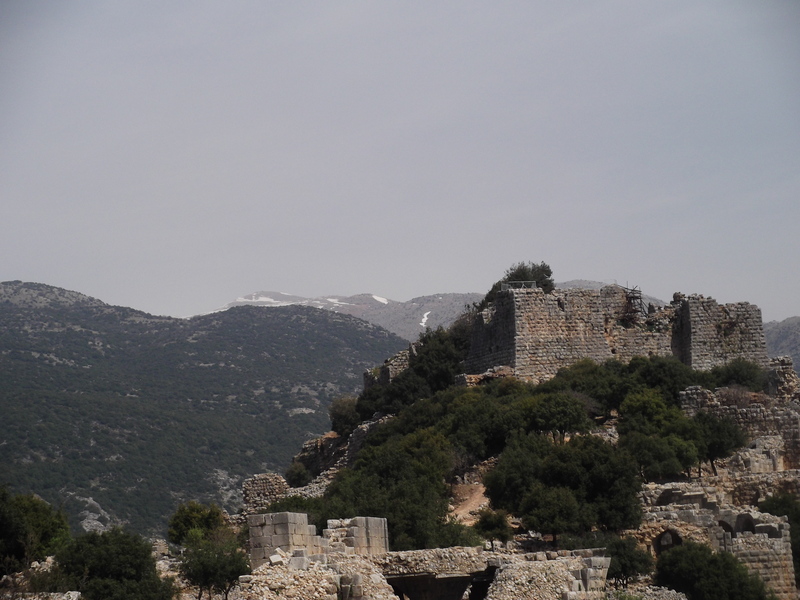 After spending a nice, leisurely time skirting the falls’ cliff-edge and watching the scores of tourists and school-children enjoying the same beautiful spot, we got into the car and continued on to Banias. 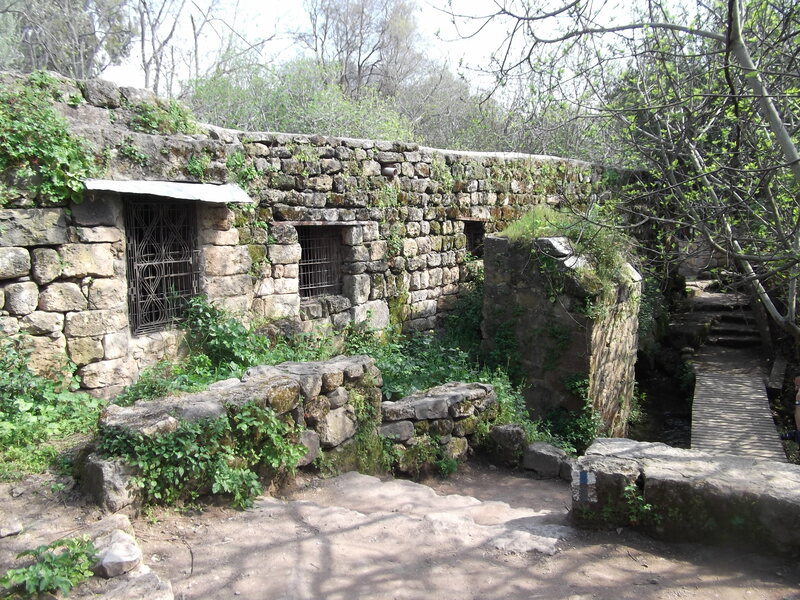 We pulled into one of the Banias park entrances and got out to see Pan’s Cave, ruins of what once was a large Greek temple complex built in honour of Pan. 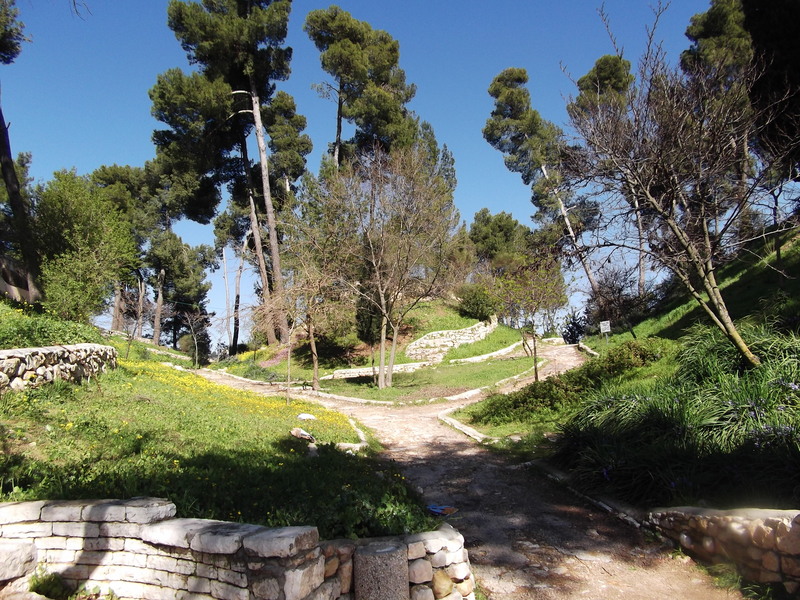 Today not much remains of what once was the Temple of Augustus, the Court of Pan and the Nymphs, the Temple of Zeus, the Court of Nemesis, the Tomb Temple of the Sacred Goats and the Temple of Pan and the Dancing Goats. But what lasted was the name of Pan: “Banias” is an Arabic corruption of the word Panias or Paneus, referring to the Greek god Pan. We then continued on to the Roman Bridge and the old flour mill, only minutes away down the Hermon Stream. It is truly amazing to see such history all over, even the ancient flour mill which still stands today and is theoretically fully operational. There is a Druze pita stand just outside the mill but apparently the flour comes from a more commercial source. After the flour mill we turned back and made our way to the car. 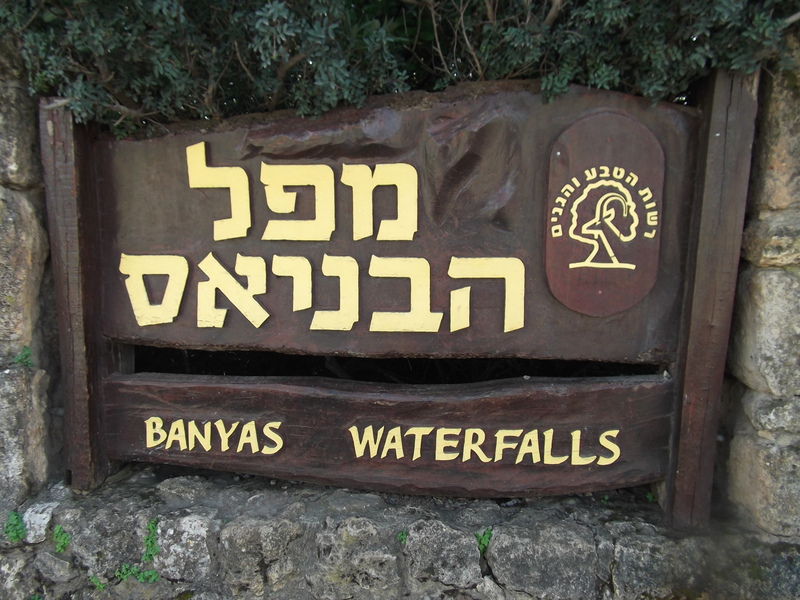 We hit the road and found the park entrance that is beside (and above) the Banias waterfall, the largest waterfall in Israel. 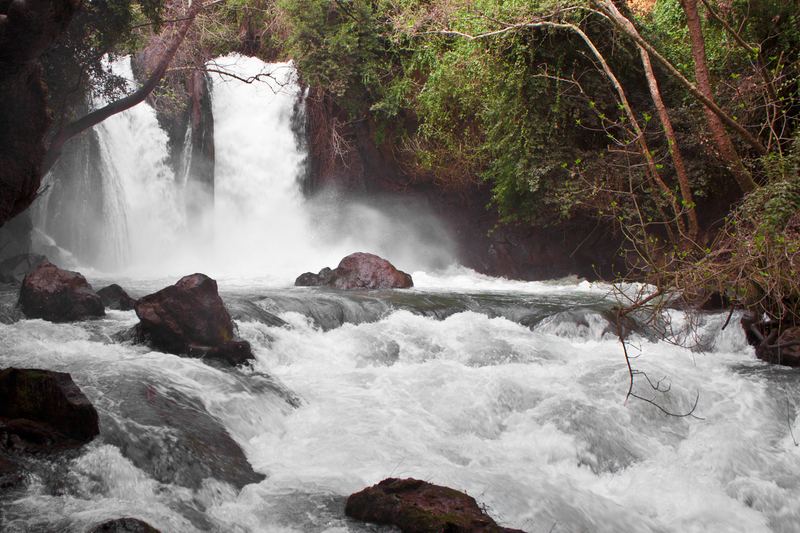 There we were to make our way down a gorge gashed into the lush green land and find the roaring white Hermon Stream as it pounds its way down from Hermon mountains and to the Kinneret (Sea of Galilee). 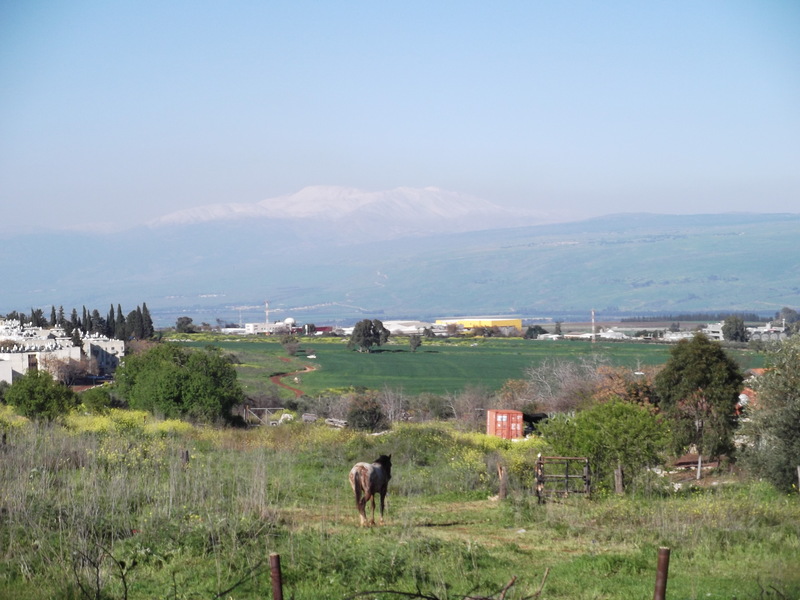 Yesterday, I went, for my very first time, to the Upper Golan. 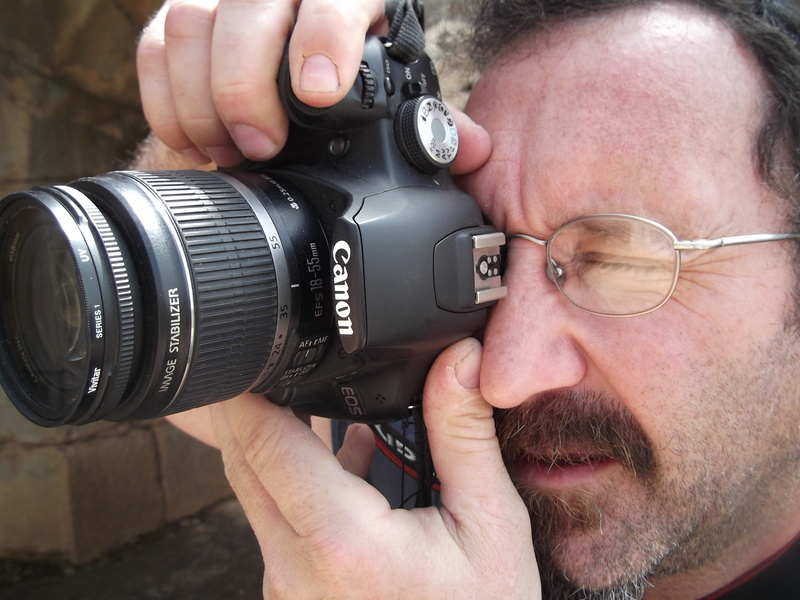 I accompanied Boruch Len, a master of photography, and we set forth to explore (and document) some of the Golan’s grandeur. 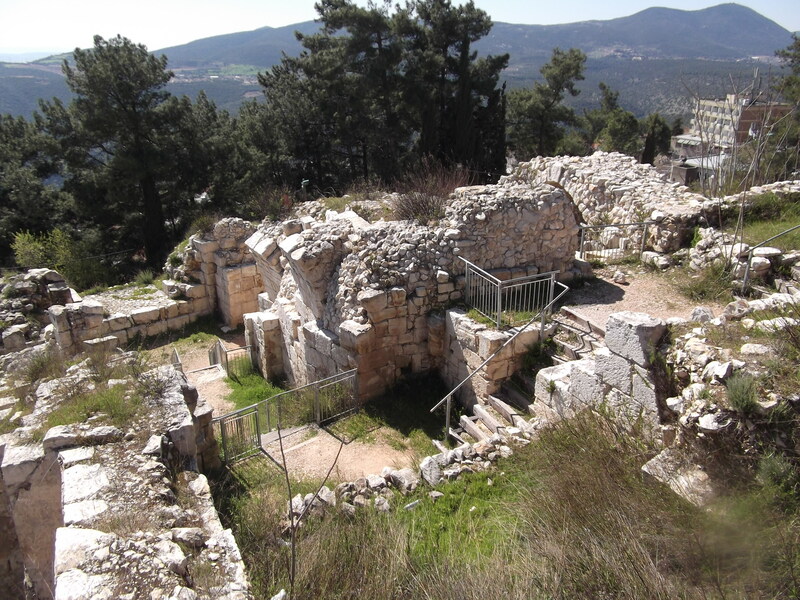 The first place on our list was the huge Nimrod Fortress, an old castle built over a 46-year span in the mid 13th century by the local ruling Arabs (construction was started by the nephew of Saladin – the arch-enemy of the Crusaders). 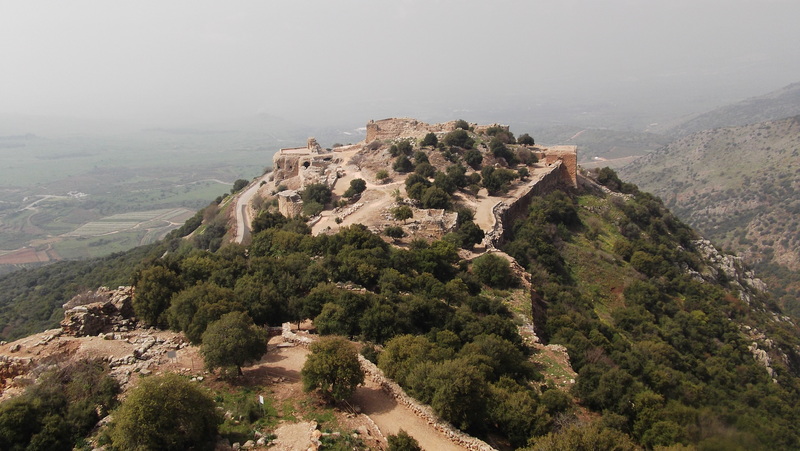 The Nimrod Fortress happens to be the largest Crusade-era fortress/castle in Israel and was used in the filming of the Academy award-nominated film Beaufort, replacing the actual Beaufort castle which is in Lebanon, out of reach for Israeli filmmakers. Just to point out, this was a trip heavily influenced by photography – however, the weather made consistent photography tricky. The clouds and sun played their games throughout the day and so the following pictures will appear as if taken on separate days but have really been simply subjected to finicky weather. Descending to the “dip” of the fortress, we found a few interesting rooms, each one better than the next. 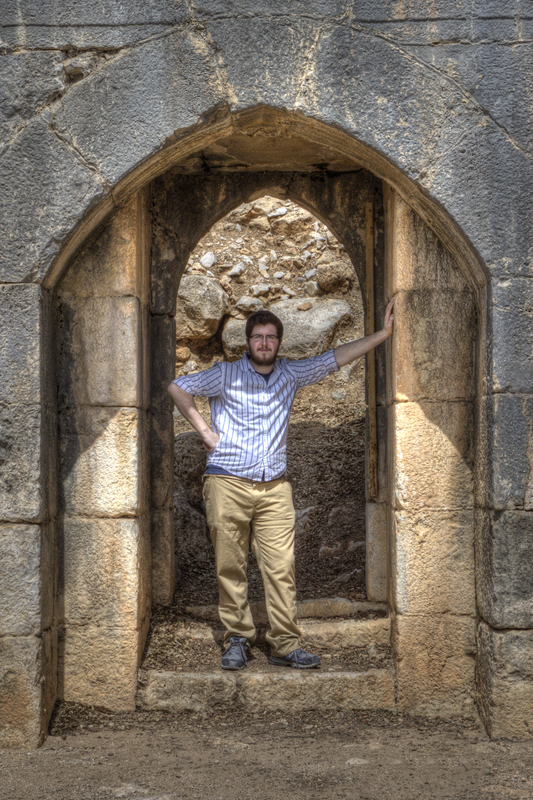 The old, thick stone outside walls had tons of “archery ports” – with those slits for shooting down on invaders. We spent many minutes snapping pictures of the various angles, trying to capture the best photo possible – each with our respective cameras (Boruch Len – fancy SLR with multiple lenses / me – run-of-the-mill-but-kinda-heavy-on-the-features Fujifilm digital camera). Boruch Len "on the job"
As can be seen in the picture, the camera retained two ghostly appearances of me. I’d have to be constantly moving for the words to appear without my body showing as well. Nonetheless, it was great fun and it made me want to buy an SLR camera. Maybe I will one day… Returning to the fortress, the ceremonial hall was not the only thing interesting on the West side. Soon we came across the Large Reservoir, alive in a flurry of chirping and cooing birds. 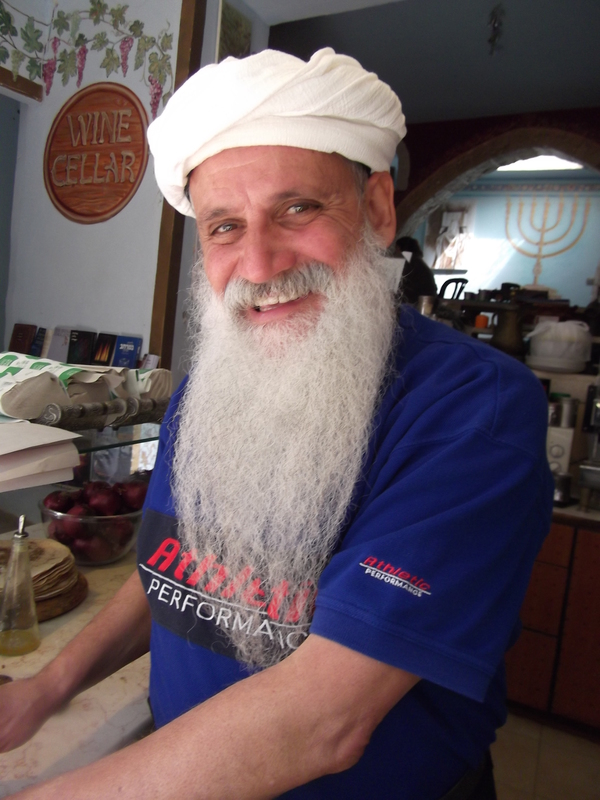 Two days ago, Sunday to put a name to it, I travelled to both Tzfat (Safed) and Rosh Pina. 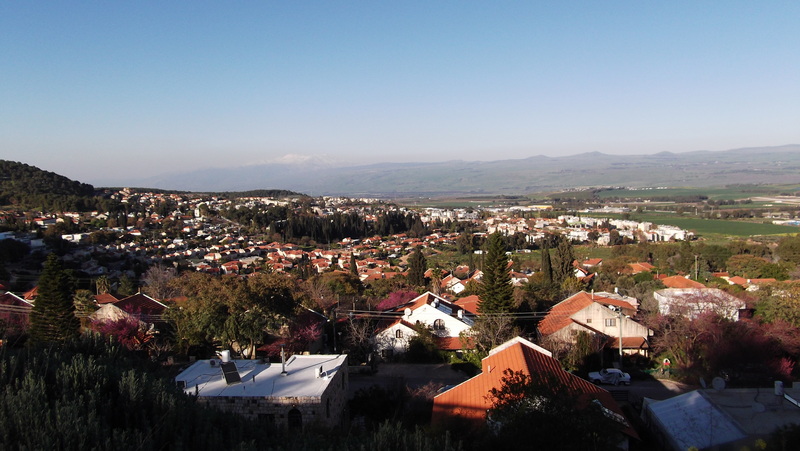 The Tzfat leg of the journey was covered in yesterday’s post (here) so today’s post will address the lovely little city of Rosh Pina. When the bus pulled into Rosh Pina, and I had made my way to a large city map, I sought out the old neighbourhood. There, in the oldest part of town, are the quaint, charming houses and buildings that draw tourists and locals alike, as flowers attract bees. I asked a local youth how long it takes to walk up the mountain to the old neighbourhood (as bus routes do not extend that far) and he told me it was a ten-minute walk. He was wrong. It was more like a twenty-minute walk… and uphill. But, the walk was more enjoyable that one would expect. Along the sidewalk the city council of Rosh Pina installed various maps and pictures, set in stone, and often accompanied with descriptive and biblical text. 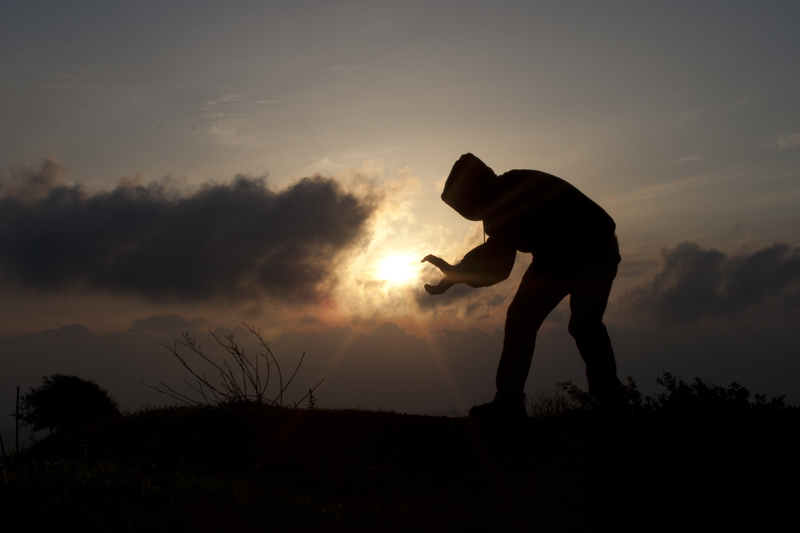 It sure made the walk pleasant – that and the magnificent view of the Western Golan area including Har Chermon (Mt. 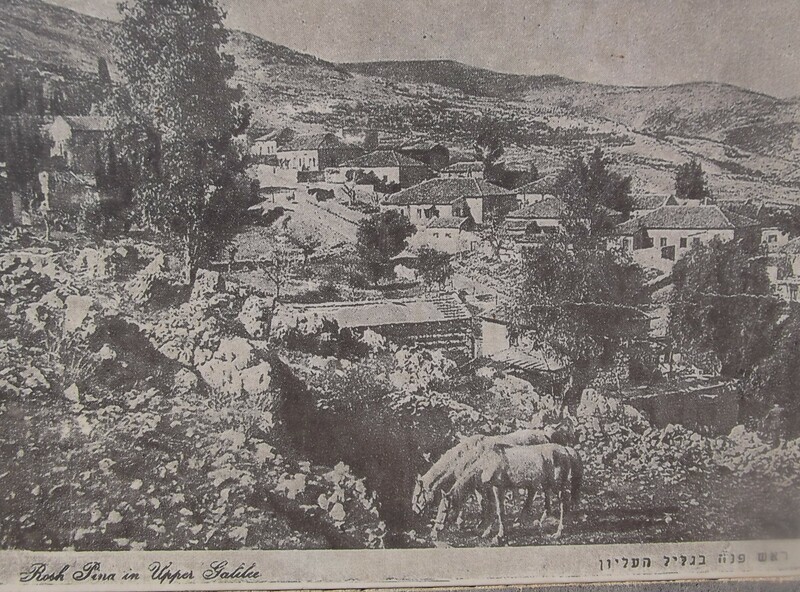 Hermon). Before too long I was in the old neighbourhood, and feeling a combination of confusion and peacefulness. There, to my right, was a house and a garden… and a sign that said Blues Brothers Pub. I could hear strange bird calls coming from the house, and the yard around it, so I ventured through the gate. What I found was very strange and despite the many people milling about, nobody questioned my presence. 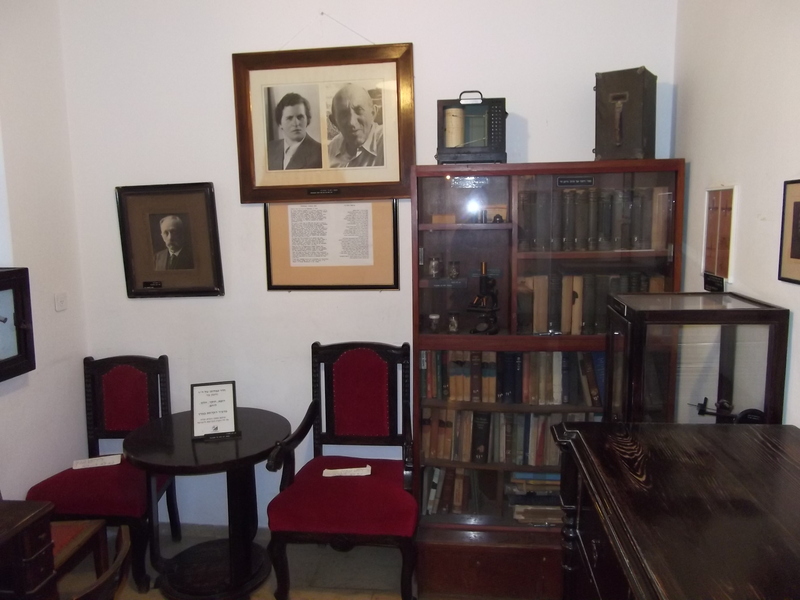 I sat down on a rocking chair made of wood and rocked, watching the people run about – some in a dither. After thoroughly exploring the complex; the pool, the sauna, the bird cages filled with brightly-coloured tropical birds, the animal pens containing chinchillas and other small furry creatures, the pub and the pool hall (which were both closed), I stopped a man who was darting about and asked him to identity the place I was in. 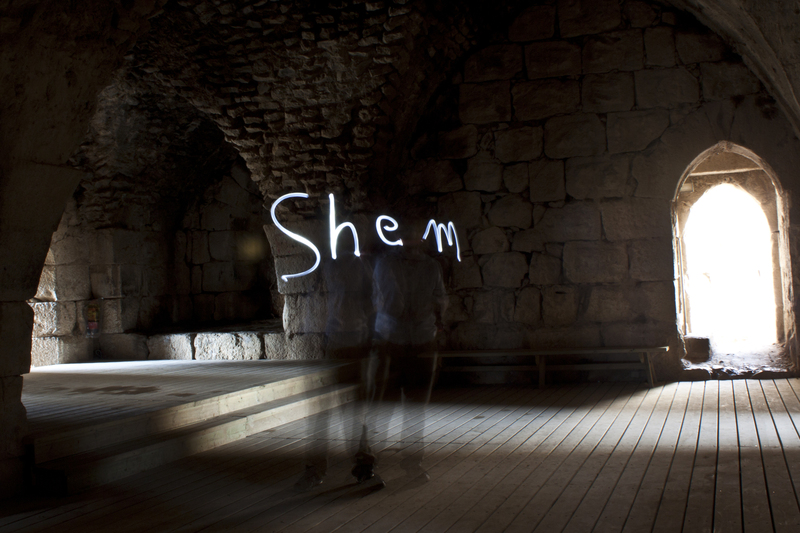 He replied in one short simple Hebrew word that answered everything: Tzimirim. 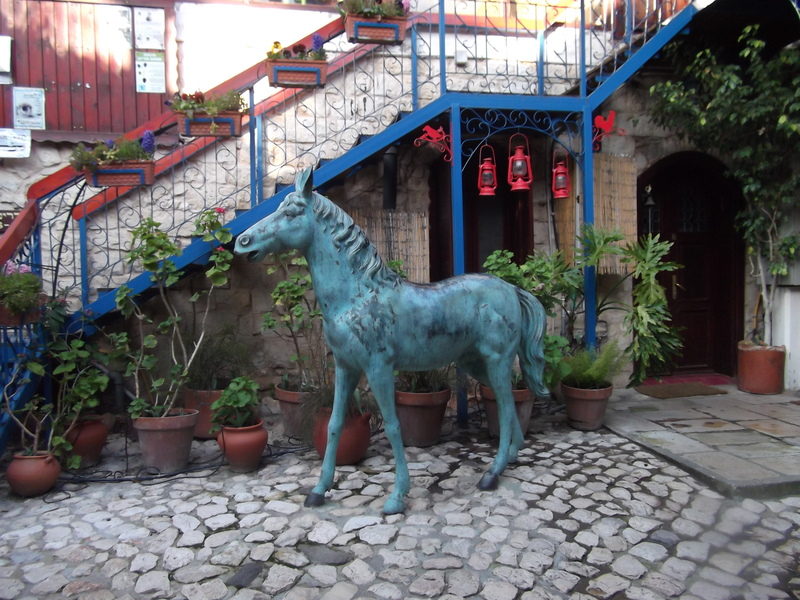 A tzimir is like a bed & breakfast just not always having breakfast featured. 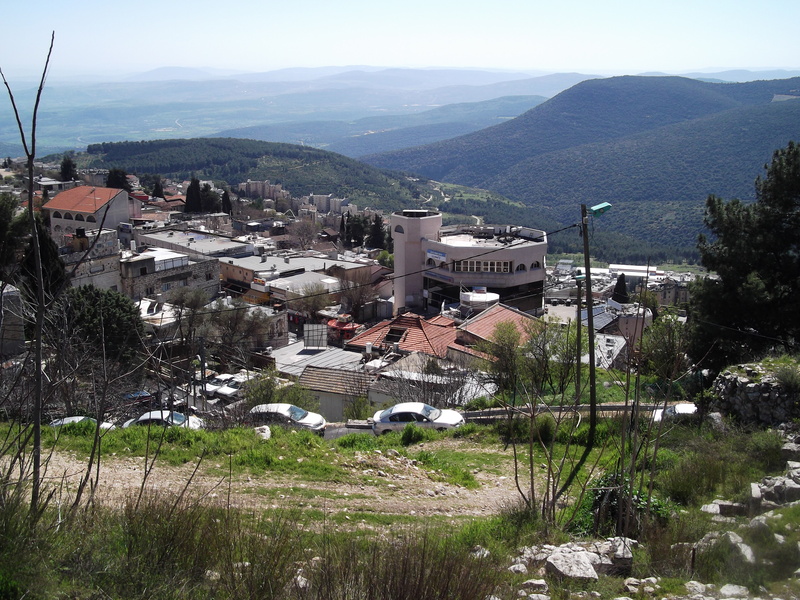 The tzimirim are usually, if not always, privately-owned and managed and are a popular for both tourists and locals looking to get away from their hectic city lives. I gave a nod of understanding, thanked him and left. My next stop was the Baron’s Gardens, but I only spent mere minutes there. I returned to the main street and asked directions to the “tourist attractions.” What I found next was the Mer House, a house given to Professor Gideon Mer by the Baron Rothschild (who founded Rosh Pina) as an office for the Professor to work on discovering a solution to the malaria plague that troubled those living in the area of the swampy Hula Valley (which I have also done a post on, here). After a look around I went into the next building and entered a room which was playing a video about Rosh Pina’s history. When the video ended and the lights were turned on I saw that I was standing among a tour group of sorts. I tagged along, lagging in the back, eager to see where they went next. After some time I caved in to my curiosity and asked one of the young men where they were from. 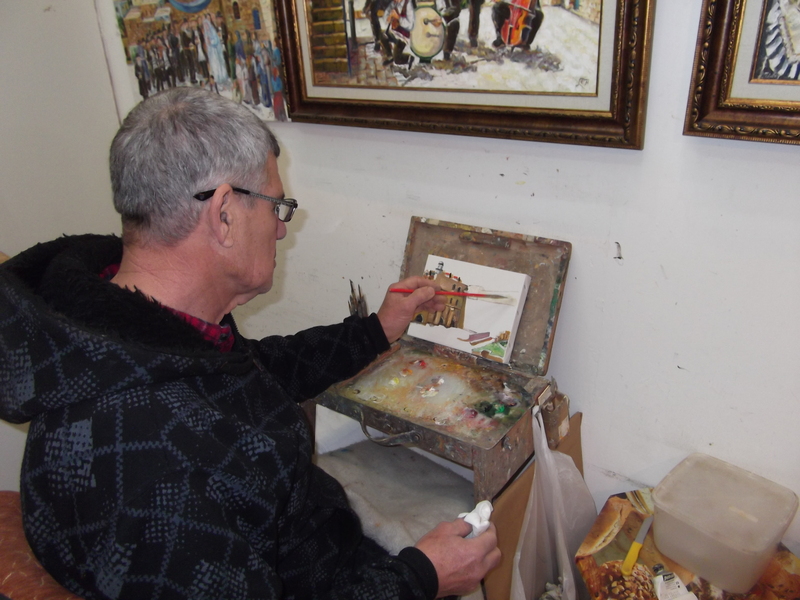 And his answer: Bar Ilan University (in Tel Aviv). So, I continued tagging along as they continued on to the next few sites, the old cemetery and the Shlomo Ben Yosef cave, a memorial to several fallen soldiers. The students, and their professors and teachers didn’t seem to mind my presence, neither did the guard, so I persisted. At last, when I revealed myself as a journalist looking for the tourist attractions in Rosh Pina, one of the students (and the guard) suggested that I speak to the mustached professor. I did, and he accepted me warmly into his fold, telling me to join them in their tour. 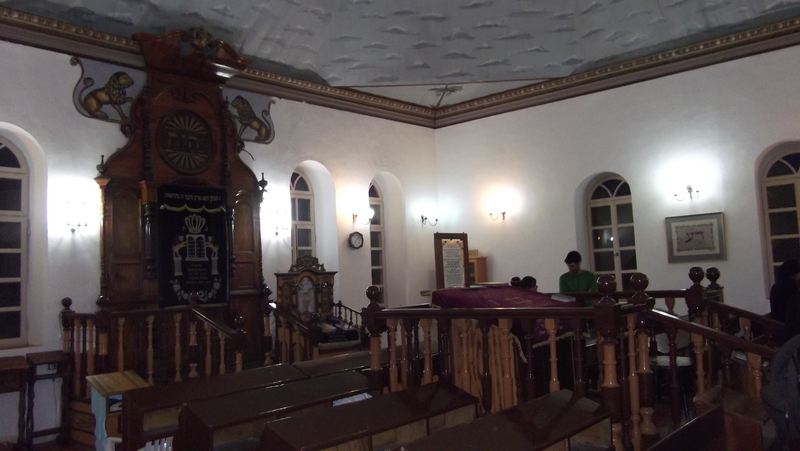 The next site we went to was the old synagogue in Rosh Pina, the first public building in the development to be built by the Baron Rothschild. 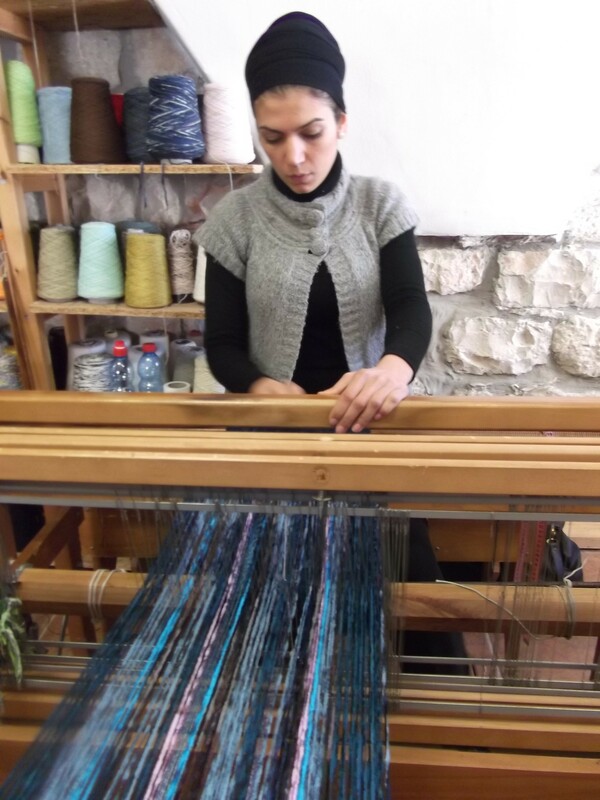 Yesterday I went to both Tzfat (Safed) and Rosh Pina, neighboring cities, and had a really interesting time. 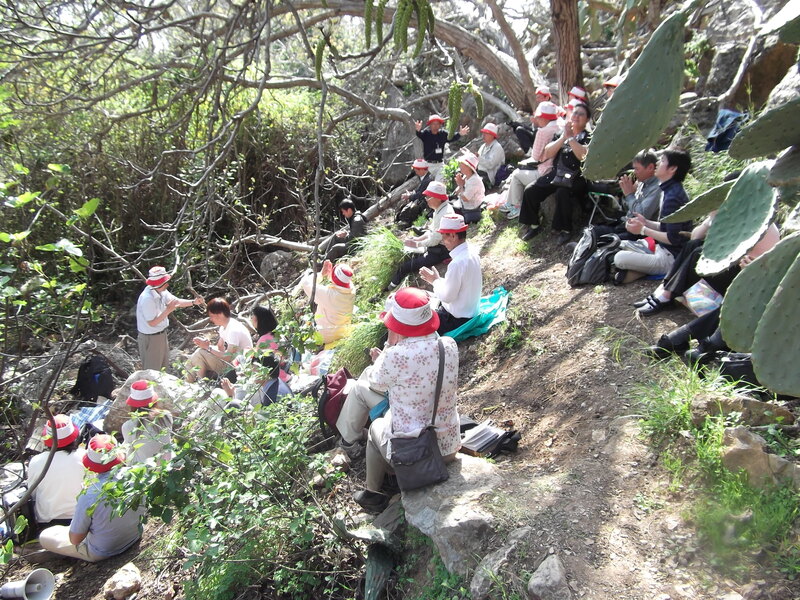 This post will contain the Tzfat portion of the trip and tomorrow’s post will be of Rosh Pina. When I was finished with my orange I headed back down the mountain to the Old City where I got some lunch and made my way to the bus station. There I boarded a bus destined for Hazor with Rosh Pina, my next destination, just fifteen minutes away. Rosh Pina was an interesting story but it will have to wait ’till tomorrow.